Last time we were treading in the 2000-year-old footsteps of our Iron Age ancestors with a visit to Castell Henllys. 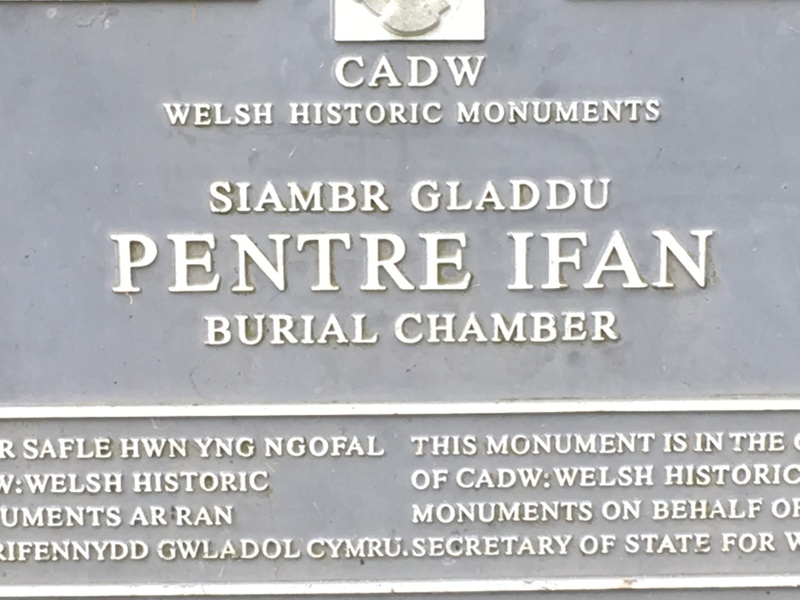 To round off our week in Wales, we’re travelling even further back in time to visit two of the country’s best preserved Megalithic monuments: Pentre Ifan and Carreg Coetan Arthur. 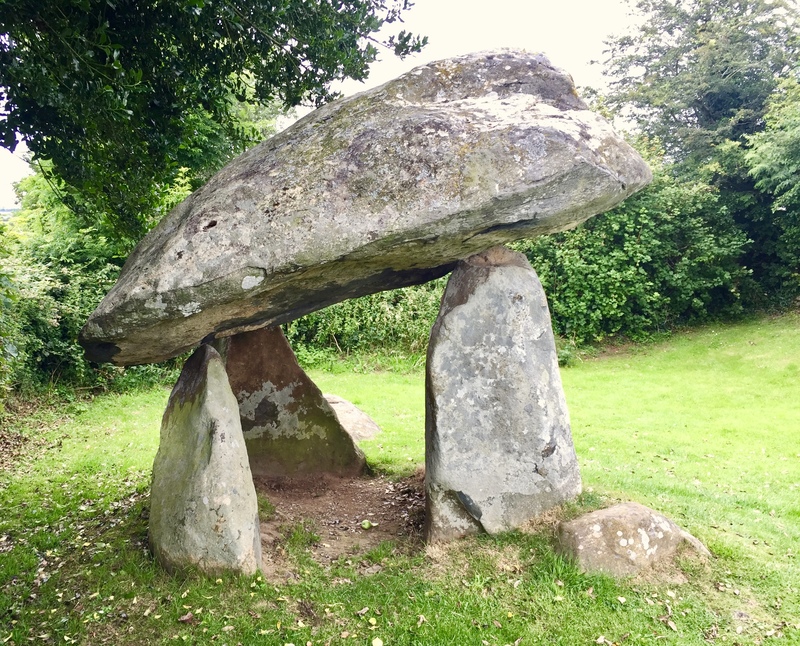 Situated in a field three miles west of the town of Newport, the dolmen stands like an ancient sentinel on the crest of the hill, keeping silent watch over the Nevern Valley. 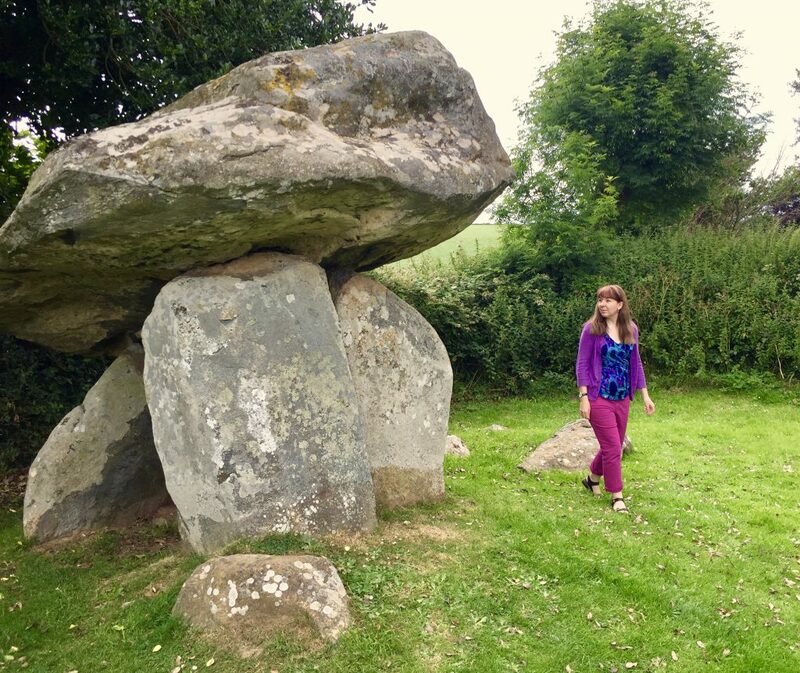 Dating from around 3500BC, the seven standing stones we see today are all that remain of the chambered tomb that once served as a communal burial site for the ancient people of the area. Excavation in the 1930s and 1950s revealed the chamber lay within a shallow oval pit, known as a long barrow, the sides of which were surrounded by a drystone wall of packed kerbstones, covered by a trapezoidal mound of earth, extending 120ft in length to the rear (north end). Towards the southern (higher) end, two of the uprights would have flanked the doorway that stood at the centre of the chamber’s semi-circular facade, the design of which appears similar to an Irish passage tomb. The third stone, set at an angle, was possibly used as a blocking stone to seal the tomb after use. 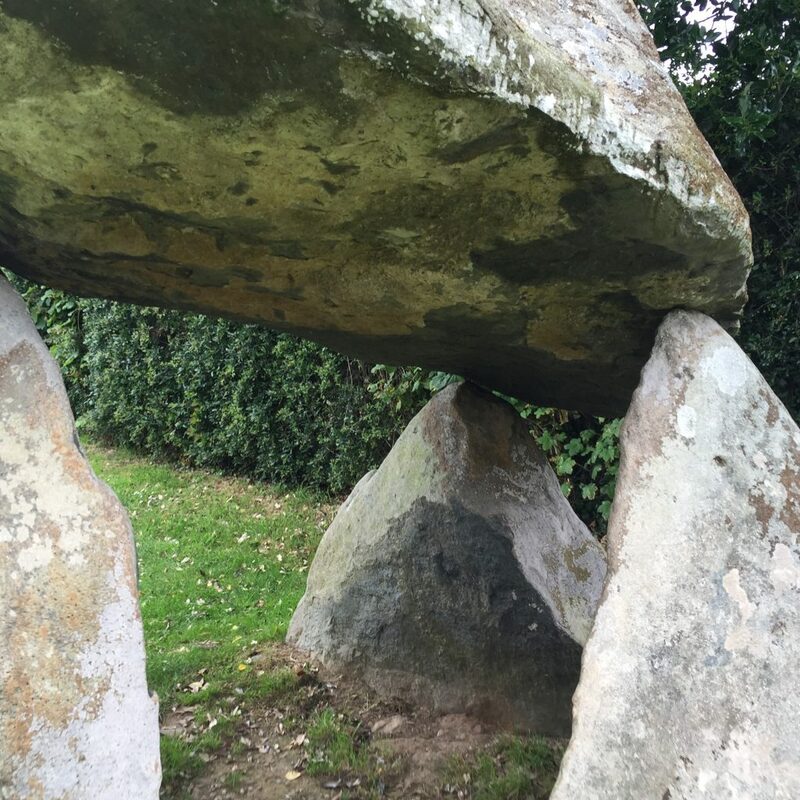 More recent archaeological research has shown that the original burial chamber predates the megaliths, suggesting they were built during two different time periods. No bones have been uncovered, apart from some fragments of pottery and flint tools. 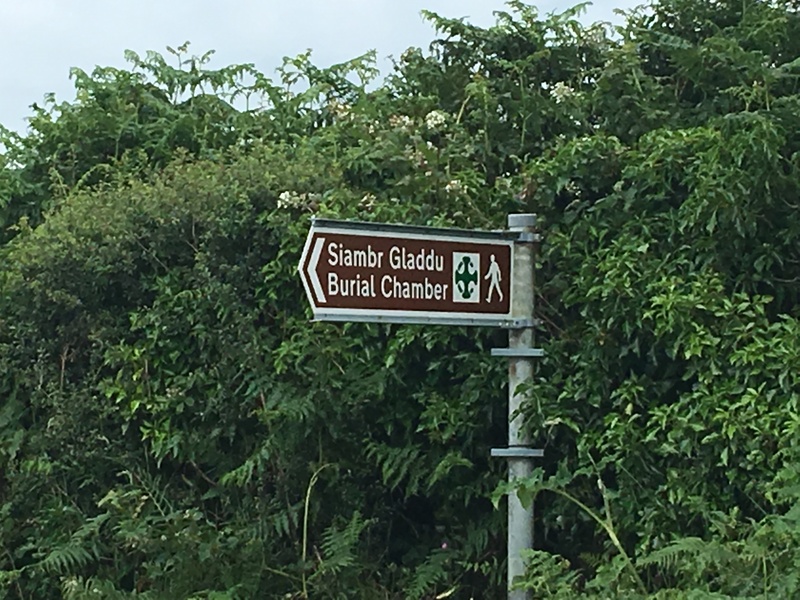 Although it was relatively common practice for personal grave goods to be interred with the deceased, it does seem strange that a tomb used for multiple burials over such long period of time wouldn’t leave some trace of human remains. One possible explanation for this anomaly is that they were removed at a later date and taken elsewhere, perhaps during the migration of the Neolithic Welsh people further south. Most the stones have disappeared with the passage of time, with the exception of the seven in situ (the magic number) and a few scattered boulders lying nearby. 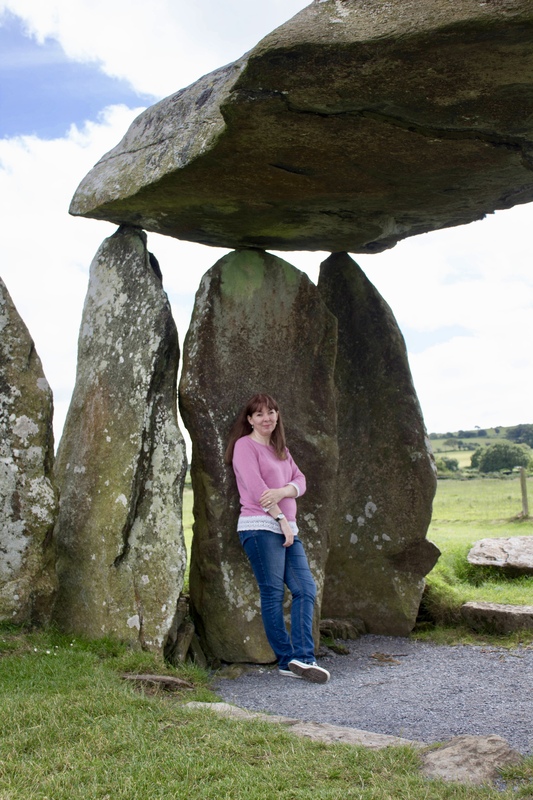 The largest of these huge megaliths, is the 16 foot long, wedge-shaped capstone, which despite its colossal 16 tonne weight rests only on the tips of three of the 8ft high uprights and looks from certain angles almost like it’s floating. It’s mind-boggling to think the Neolithic Celts were able to haul these massive slabs of igneous rock into place simply with ropes and their combined brute strength. The longer I gaped up in wonder at the gravity-defying capstone, the less ridiculous it seemed to entertain the possibly that it had instead been been placed there by the hand of a giant. Or, if you believe the local folklore, magically thrown by King Arthur as a demonstration of his great strength, which is why Pentre Ifan is also known as one of Arthur’s Quoit’s. We’ll probably never know exactly how, or more importantly, why this impressive structure was built. 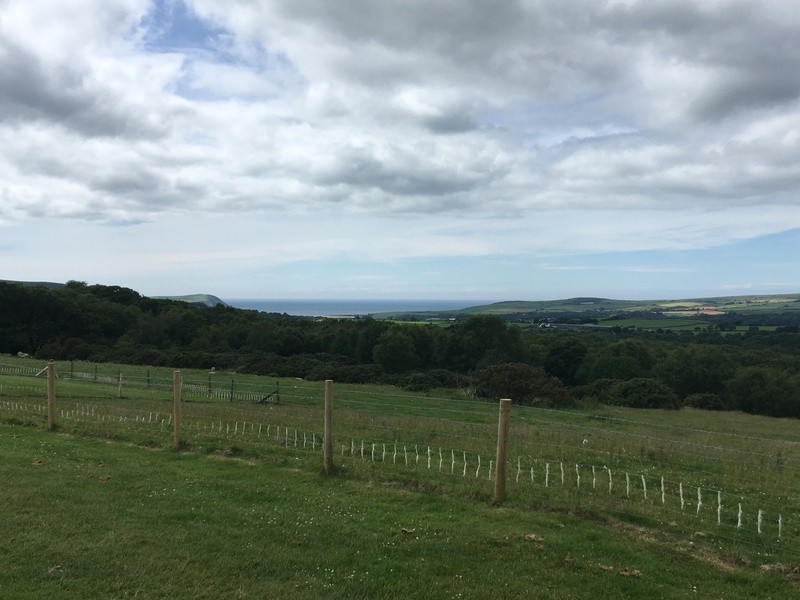 With commanding views over the Presili Mountains to the north and the sacred hill of Carn Ingli to the west, (also known as the Mount of Angels) it does however seem likely the location was intentionally chosen with the landscape in mind. From this elevated position, the monument would have been seen for miles around, perhaps acting as territorial marker for individual families to claim their right to the land in which they lived. However, it’s also possible their reason for burying their dead here held a more spiritual significance. Many ancient cultures regarded hilltops and mountains as sacred places where elemental spirits and gods dwelled. People of the Neolithic period would have naturally gravitated to higher locations to commune with the gods they worshipped, and where the energy of the land was deemed strongest. 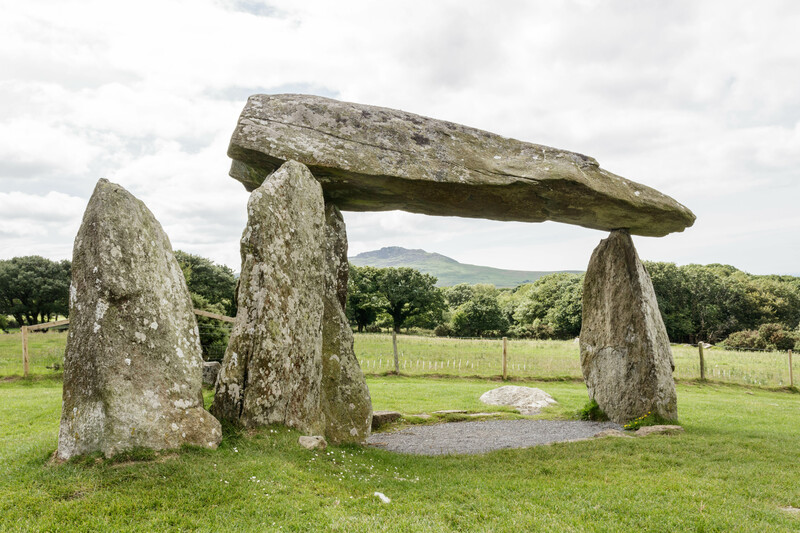 Perhaps burial tombs like Pentre Ifan were erected as a mark of respect to the Mountain Spirit, in the belief this would assist the dead in their journey into the afterlife. 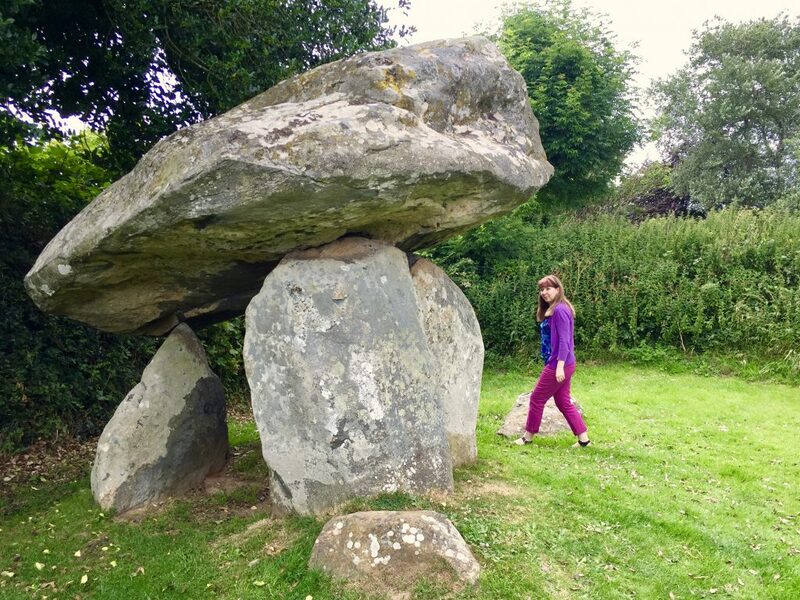 Another more mystical theory I find particularly interesting is that the burial chamber served as receptacle for transmitting and harnessing the magical energy of the local bluestone, which is said to contain magnetic and healing properties. Found only in the surrounding Preseli Hills, this special blue-grey dolerite was famously used to build the inner circle of Stonehenge 5000 years ago. How the heck these massive slabs of stone were transported some 240 miles to Salisbury Plain in Wiltshire isn’t known, but it must have required superhuman effort – or maybe telekinesis! It’s also been proposed from the angle and north-south orientation of the capstone – which mirrors the rugged slopes of Carn Ingli – that this was a deliberate rather than accidental part of the dolmen’s construction. Topographical research of other Neolithic stone monuments spread across the Britain Isles and Orkney appear to follow similar unusual geological patterns, which some scholars theorise could have been orientated intentionally to align with the astronomical points of the solstice and equinox, in the same way the position of the Great Pyramids of Giza appear to reflect the constellation of Orion. 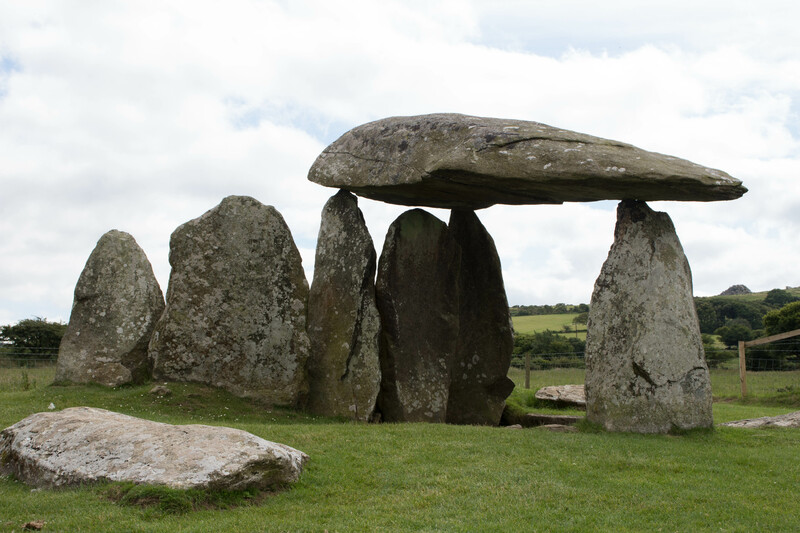 Whether the site at Pentre Ifan was used primarily for burial or served other ritual, astronomical or ceremonial functions, the spirits of the dead weren’t for telling. Though I suspect their souls have long since departed, because I didn’t feel the slightest chill standing on the ground their bones once lay. Perhaps if I’d visited under the cover over darkness instead of the middle of the day, I might have a caught a glimpse of a fur-clad shadow, or the scarlet cap of a fairy frolicking around the stones. Local legend has it that the monument is actually a portal to the Land of the Fae, guarded by child-sized beings dressed in soldier uniforms and red caps. It seemed fitting to finish our Welsh Adventure with a visit to Carreg Coetan Arthur, which we were surprised to find tucked away at the end of a quiet cul-de-sac in the nearby town of Newport. The dolmen stands in its own small, private enclosure surrounded by a high hedge and accessed via a gate from the street. In comparison to its lofty big brother, this dolmen is rather dinky, although this is partly due to fact the ground level has raised considerably since Neolithic times. Excavation in the late 70s showed that the base of the supporting stones actually go another three feet below the current surface, which means the monument would have originally stood much taller than it does today. Despite its petite stature, the 13-feet-long mushroom-shaped capstone strikes an impressive pose, especially when you walk underneath and discover its precariously balanced on only two of its four uprights. 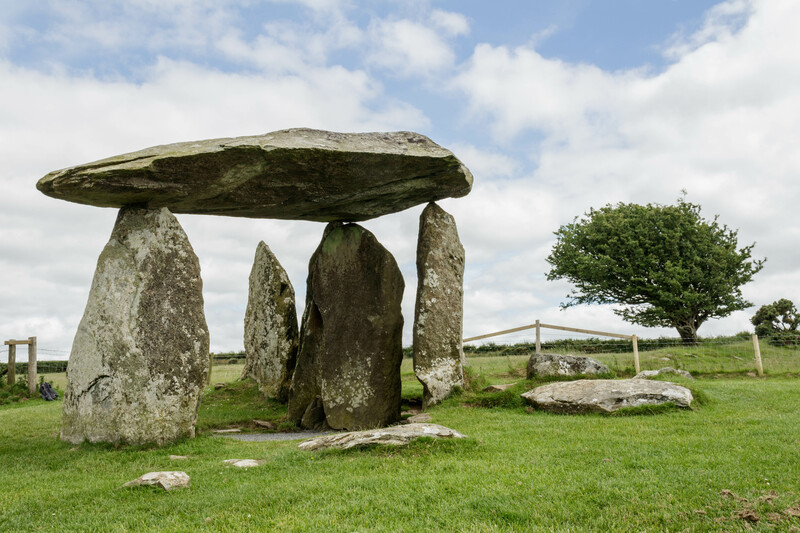 Carbon dating of cremated human bones and pottery vessels found date the site to around 3,500 BC, the same time Pentre Ifan was built. Whilst this dating method is reasonably accurate, there’s no conclusive evidence to suggest that the monument might not be older than its proposed chronological age. We do know, however, from the pieces of Bronze Age beakerware discovered that the chamber has been in use for thousands of years. What isn’t known is whether the dolmen was covered by a cairn, left open to the elements, or partially covered with smaller stones. There are a few half-buried boulders scattered around the field, but whether they were used as part of the tomb’s construction remains as much a mystery as the ancient people who built it. Considering these dolmens were built to house the dead you might expect them exude an aura of brooding melancholy. But they didn’t. If anything, the atmosphere surrounding the stones was one of calm stillness and reverence that seemed to bewitch rather than chill me. Who knows, maybe I was tuning into the ‘healing’ vibrations of the blue dolerite around me, which by spooky coincedence shares some of the same strange properties as the draconite crystal in my current story. Or, maybe the zen-like vibes I felt came from a more spiritual source, encouraging me to reconnect with to my Celtic roots. Though I’m more inclined to believe it was nothing more than my weird little brain doing what it does best – imagining things that aren’t there – part of me would still like to think there are some mysteries, like these fascinating megaliths, that are better left unexplained. Whatever mystical force drew me to Gwlad Hud a Lledrith, the land of magic and enchantment, I’m glad it did, because I left feeing a whole lot better than when I arrived. Which only goes to show, you don’t always need to jet off to a sunnier climate to come home with a magical glow. to your rss feed and I hope you wrіte again soon! Thanks so much for your kind comment. 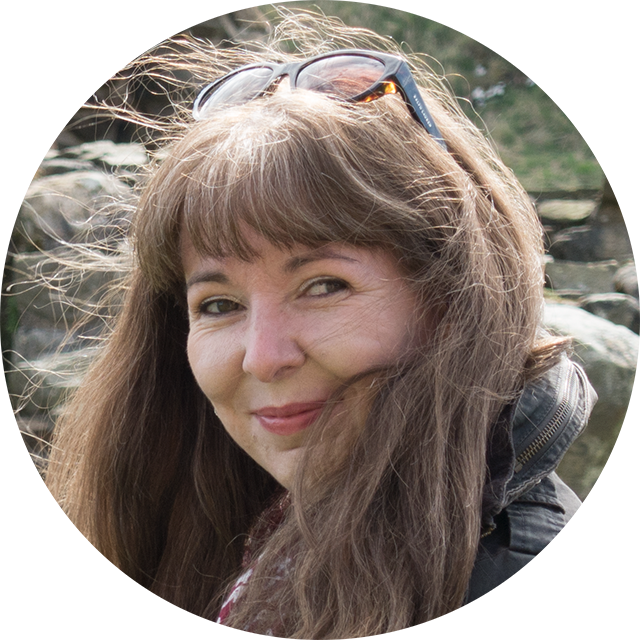 I’m not as active on my blog as I’d like as busy working on my current novel, but I’m glad you’ve enjoyed the posts so far. Hopefully I’ll find the time to add more content in between my main writing projects.